Harry N. Abrams, 9781419732959, 10pp. Illustrator Andrew Kolb first garnered attention with his illustrated version of David Bowie’s Space Oddity. Since then, he has created illustrations for clients including chickaDEE Magazine, the Toronto Zoo, and Pixar. He is also the author of Edmund Unravels and the illustrator of All Aboard! : Let’s Ride a Train and All Aboard! : The Christmas Train. He lives in Ontario, Canada. "Kolb’s spirited cartoon art offers plenty of eye candy (kudos to Kolb for Santa’s brown skin), while the long and narrow, multifaceted format is great fun." 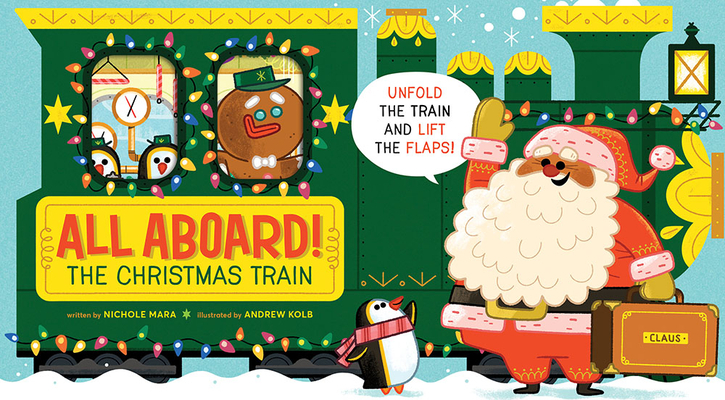 "This delightful, non-narrative excursion unfolds—literally—in a sturdy volume that extends into a yuletide train over 4 feet long . . . With so much to see, seek, and answer, this book has a ton of interactive appeal. The cartoonish illustrations are charming and rich in detail, and it is rendered in a lush, pleasing palette with a refreshingly brown-skinned Santa as its star. Train-loving tots may fancy this Christmas ride all year long."